I guess because of something I posted, there are "rumors" that I go home at 5:00 PM and don't work. Let me just say: For the most part that's true. Here are my thoughts on working for a living and what's reasonable. Take it or leave it. You have to balance your work and your life. And, just like everything else in life, this balance changes over time. It changes as you get older, it changes as your job evolves, and it changes as your personal life evolves. Second, let's look at how many hours are reasonable. I'll start by saying that the 40 hour week is silly and not much of a starting place. It is the result of arbitrary government decisions, union negotiations, and lots of things you had nothing to do with. So where do we start? In the U.S. today it is very reasonable to show up for work at 8 AM and leave around 5 PM. If you make the departure 6 PM because you're the boss, that's still reasonable. If you have a meeting for lunch, or work through lunch, that counts as working time, not time off. Thus, if you work 8-6 with no time off, that's 50 hours/week for the five-day work week. Alternatively, if you work a solid 8-5 and put in the odd hour in the early morning or the evening, you still come up with a 50 hour week. Working a few hours on the weekend brings this to 52-55 hours without really straining yourself or interfering with your family life. Therefore, I believe working 50-55 hours a week is very reasonable as a business owner. If you work 12 hours/day x seven days, that's 84 hours. That's not reasonable. I try very hard to keep my hours under 50/week. When I was a sole proprietor, I never scheduled an appointment before 9:00 AM. And I made sure I never planned to work after 4:30 PM, so I could be home by 5. I did work and hour or so each evening. But I've never done the workaholic 60-70-80 hour weeks. Even now that we're a five-person shop, I work 8-5 because my service manager wants me to be a good example for the staff. Otherwise, I'd still be 9-430! Because I am religious about putting my hours into our practice management tool, I can accurately report the hours I actually work each week. If I'm drafting a blog post at 6:00 AM on the patio while having my morning coffee, that goes into PSA tool. Same with paperwork on the weekend. This would have been five weeks, but I spent the last two Saturdays painting our new offices with my daughter. About 1/3 of my weeks are in the range of 45 hours or less. Just over half of my weeks are under 50 hours, and just over 75% are under 55 hours. The one week over 60 hours was a travel week, teaching seminars for myself and a training company. In fact, almost every week with greater than 55 hours was a travel week. I'm not dismissing travel weeks in any way. They are time away from the family, time away from normal routine, and time away from the office. They're actually pretty darn un-balancing! Working reasonable hours -- 50 or less -- is possible. It's also beneficial to your personal and professional success. When you're trapped in the workaholic environment, it's hard to see a way out. But remember that you're the boss. In my next Relax Focus Succeed newsletter, I'll discuss "Escaping from the Workaholic Environment." If you're interested in following this thread, you can subscribe for free at www.relaxfocussucceed.com. Now I'm going to get in the hot tub . . . Okay, you laggards who've been sleeping in the back row. Wake up and welcome to the 21st Century. Today we're going to talk about Idea Viruses. Your textbook will be Unleashing the Ideavirus by Seth Godin and Malcolm Gladwell. And your homework is to provide some feedback on how we can use this marketing concept "offline" in our SMB consulting practices. Some ideas spread like viruses. We've all seen examples. "Everyone" had a Palm Pilot before you even heard of it. Soduko went from a cute newspaper filler to a worldwide phenomenon. You have to try it! Google hasn't been around that long, and they're already in the dictionary as a verb. Google it. Seth Godin spells out the virus analogy. Someone uses a product or service and raves about it to his friends and associates. This is called sneezing. Some people only sneeze occasionally. Some people sneeze all the time. Some sneeze quietly, some loudly. Some sneeze to a small crowd and some sneeze to a huge gathering. If you have the right audience -- a large but closely knit group and has a lot of inter-group communication, the virus can spread very quickly. This is especially true if a handful of "promiscuous sneezers" like the idea. As a general rule, these sneezers are not paid or, if they are, that arrangement is known to the community and they are effect at spreading viruses despite the fact that they're paid. 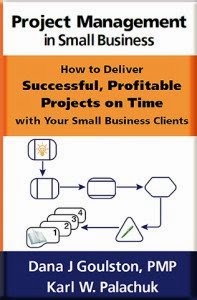 Let me give you some examples from the SBS/SMB consulting community. First, we really are a vast community with excellent communications. None of us communicates with everyone everyday, but news spreads very fast because most of us have at least half a dozen hooks into the community. These include personal email, yahoo groups, blogs, blog comments, conferences, etc. Recent phenomenon: The SBS Show. Vlad did not "sneeze" the SBS Show. He created the show and posted it. Then he initiated the virus by telling some people about it, posting it. They had all just come back from SMB Nation and they were eager for more. So they were susceptible to the virus. They caught it and told their friends. End users (not just consultants) got drawn into the mix. And they told their friends. So now everyone has the SBS Show Virus. Interestingly enough, one year ago today Vlad and Chris and Suzanne were not "promiscuous sneezers." But because of the SBS Show (among other things), they all are today. On August 12th I was honored to have Chris post a review of my Service Agreements book. He was literally sneezing to his blog readers. It may catch on, it may not. Not every virus spreads far and wide. When Vlad returned from SMB Nation East, he sneezed all over the place. He went on and on about how much he loved that conference. He didn't just check the box that said "good conference." No, he sneezed all over Vladfire and Vladville.com. So I don't think there will be fewer than 350 people at the next SMB Nation East in 2007! Who are the other sneezers in our community? Well, we all are. Viral marketing cannot succeed because a few well-known people sneeze. The product has to be good so that people use it, talk about it, rave about it, and tell their friends. But not just tell their friends. They use phrases like "You have to get this." and "It changed the way I do business." Even if all the well-known sbsers used a product, that doesn't make it a virus. A virus is easily spread. A successful virus infects a majority of the core community. - There must exist a well-connected community to sneeze into. - You have to have the right product. We all use screwdrivers, but no one raves about one screwdriver you just have to own! - The timing has to be right. Maybe 2006 is not the right time for the SBS crowd to give two hoots about Storage Area Networks. But it's a great time to discuss Managed Services. - Sneezers need to be honest. You - the marketer - are taking a chance. Our community is very honest. If you drop some crap product on this crowd, you better be ready for serious push-back. The ultimate example is Microsoft: When they do something right, Susan and Jeff and every other blog sings their praises. But the next day that might all be gone. The power of a sneezer is related to the sneezer's credibility. So all that's based on the online community. Your homework will consist of figuring out how to to this technique to market your SMB consulting business to your local SMB customers. 2) Now, as a group, let's see how we can use this concept in marketing to the businesses in our communities that need to buy our consulting services. How can we get people to sneeze an SMB Consultant? Don't wave your hand and say "That's all just word of mouth advertising. We do that." Bzzzzzzzzz. I'm sorry. Thank you for playing. That answer's worth 1 point (out of fifty). We're not looking for "I use xyz Networks." We're looking for raving fans who spread your name all over the place. I welcome and encourage your feedback. Here or in email. The details are settled. I'm going to be giving a free seminar on 9/7/2006, the day before SMB Nation, at the Microsoft Conference Center. Disclaimer: If you want the deep dive into Managed Services, your time is better spent with Amy, Steve, and Chad at the Mobilize event. http://www.mobilizesmb.com/default.htm. That's a full-day workshop 9:30 AM - 4:00 PM. 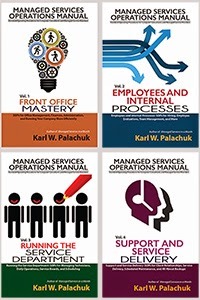 If you're considering managed services, do that workshop! In this FREE seminar, you'll see one consultant's perspective on building a successful practice. While there are some technical topics, this is primarily a business- related discussion. We will cover the how and why of technical procedures, but not dig into the details. If there's one thing KPEnterprises does to be successful, it's develop forms and procedures. While we're not going to give away all our secrets, we'll show you some of our "best practices" with regard to using standardized forms for everything from network migratiion to weeding out yur clients once a year. Please note: we will not be distributing any of our forms at this event. We will make the PowerPoint slides available to attendees.